Delivery without felt glides, please order separately! A classic with many faces: the comfortable cantilever Jimmy is available with round tubular frame and a base made ​​of flat steel as well, in both models with and without armrests. 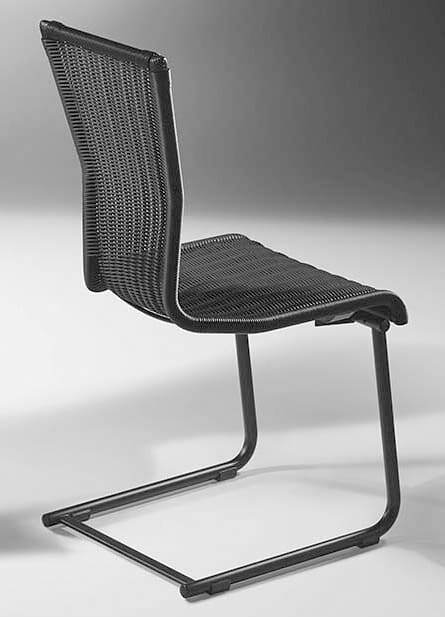 Seat and back are carefully hand braided from Saleen in the wicker colours you can choose from a wide range of colours. The chair frames are either made ​​in high gloss or matte chrome. The elegant cantilever has a high seating comfort, is timelessly modern and fits in classic living environment, for example as a dining chair, as perfectly as in modern facilities. In the public sector - as a conference chair or waiting room seating - Jimmy makes a good figure too. Modern living makes many simultaneous demands on its spaces. Bacher (the Collection) has dedicated itself to this theme. Wood, glass, natural stone and metal are the elements Bacher develops pieces of design furniture as well as entire concepts that are made especially for people requiring a high level of flexibility. Do you have a question about "Jimmy"? How can we contact you?